Earn 23 loyalty points when you order this item. 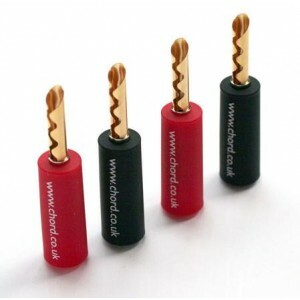 Chord Company 4mm banana plug termination kit includes four 24kt gold plated banana plugs (2 x red and 2 x black for a pair of speaker cables) with Chord Company plug surrounds. These easy to fit banana plugs include screw fit terminals within the plug for easy fitting. An easy way to terminate any bare wire speaker cables. Includes instructions.